Happy Monday! Today, I'm narrowing down some of my favorite purchases from the month of September here on the blog. Being a life and style blogger, I definitely purchase more items in a month than I would if I wasn't running a blog. So, I wanted to share what I purchased last month that I really think is worth your money because I've used it first hand and I can honestly report back on the quality/style/fit of these items. During the month of September, it's still definitely summer weather so buying things can sometimes be tricky. You don't want to buy something that you won't get a lot of use out of but it's also hard to buy a sweater or jacket when it's ninety degrees out! So for me, I buy items that I can wear now and later. Everything I'm sharing in today's list of favorites are things that I am currently wearing but that I also plan to wear later. I love buying items that I can get a lot of use out of! Also, I always try to buy items that work together. That's why I love neutrals so much! They always work together and creating outfits is a lot more simple when you work within a similar color palette. 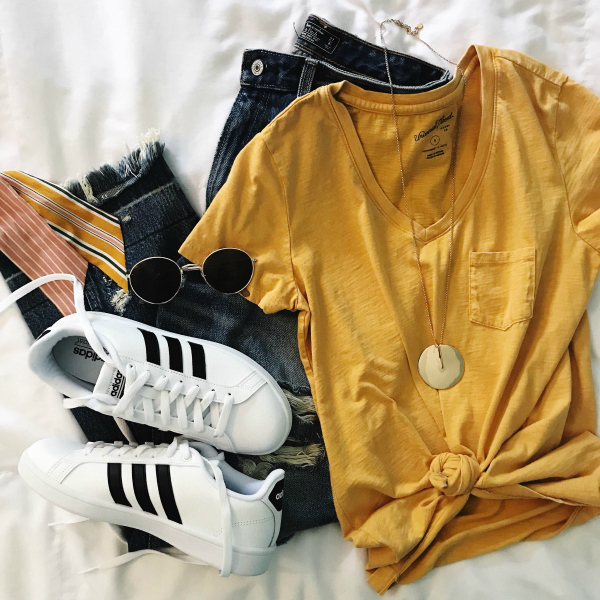 I'm all about simplicity while still remaining put together (and comfortable, of course)! B L A C K L E A T H E R T O T E + S I L K S C A R F | This black leather tote was definitely an investment piece but for me, it was a wise purchased. I bought a faux leather black tote last year that was super similar. I literally carried it almost everyday last fall/winter so I decided to upgrade my black bag. I wanted a bag that would last for many years to come. I love the quality of this bag and the overall style. It holds so much without being super bulky! 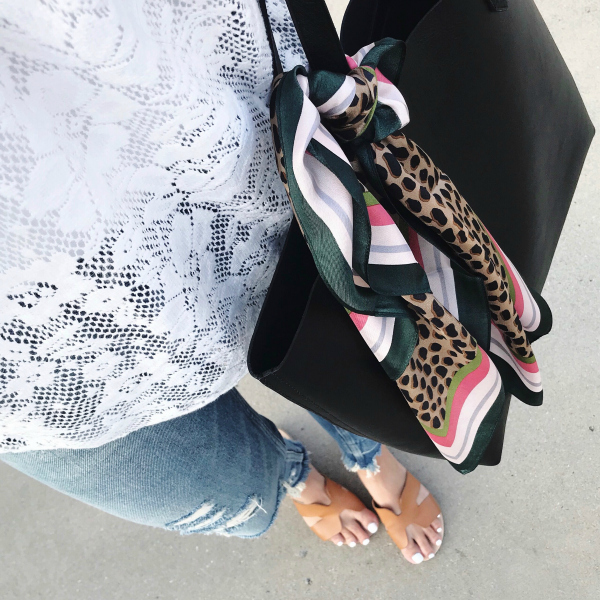 The silk scarf tied on my bag is one of my very favorite purchases from the month for several reasons but mainly because it's super cute! I absolutely love the colors and the leopard print. It makes me simple black bag so much more interesting. I love it! 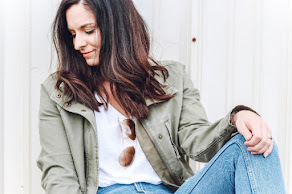 S N E A K E R S | I was looking for a good pair of sneakers that weren't necessarily athletic sneakers for working out but rather athleisure sneakers for wearing out of the gym. I love this black and white pair! I personally sized down a half size for the best fit. They so require some breaking in but they are so comfortable once they are broken in! 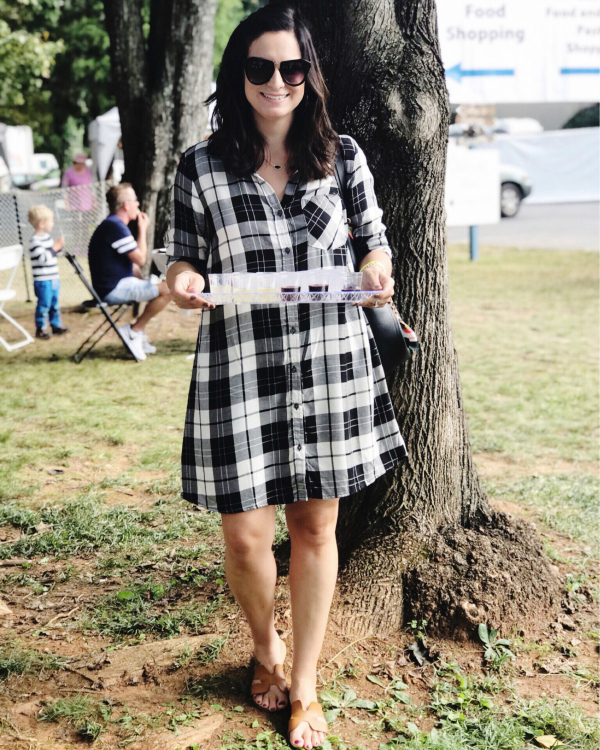 P L A I D D R E S S | I wore this dress to the Greek festival this past weekend and it was a great transitional dress to wear while the temperatures are still super warm here. I love that it looks like fall but you won't overheat wearing it outside when it's 80 degrees. It will also transition into cooler temperatures perfectly by throwing on a cardigan and adding boots to the look. I sized up to a medium for an extra swingy fit! B L A Z E R | Like I've already mentioned last week, this blazer was an out of the normal purchase for me but I'm so glad I bought it! It instantly dresses up a casual look and adds so much interest to an otherwise simple look. 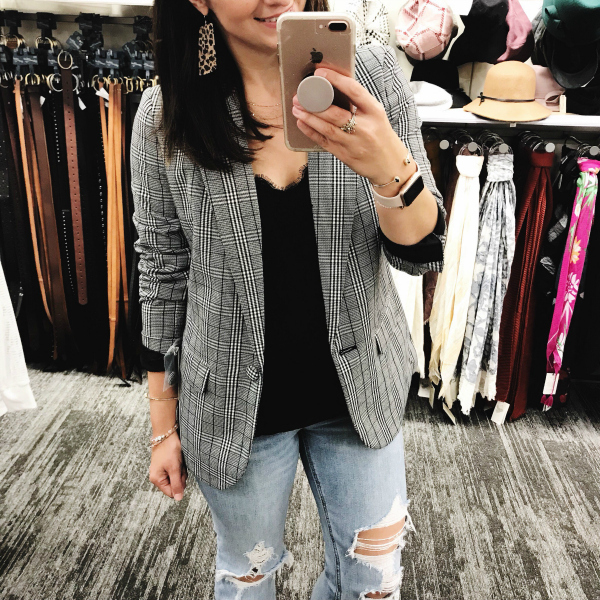 I love that I can make this blazer work for my casual lifestyle! It's also amazing quality, especially for the low price tag. L A C E T R I M C A M I | This cami was another great budget friendly find from this month. The fabric isn't see through and the quality is fantastic, especially for $15! 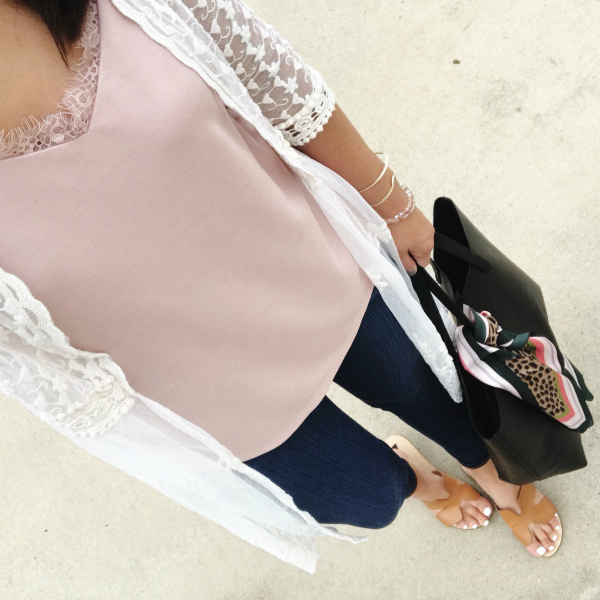 I love pairing a cami with a cardigan or denim jacket for fall. The fit is true to size. 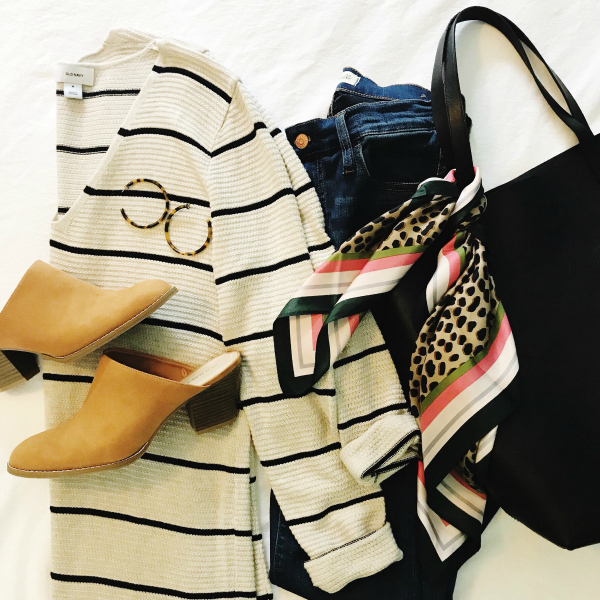 S T R I P E D T U N I C + M U L E S | I love stripes so this tunic caught my eye right away. I love the tunic length that works perfectly paired with leggings. The fit is a little small so I sized up to a medium for the best fit. It's going to be one of my go-to pieces this fall and winter! The mules are the perfect transitional shoe! I have worn them with dresses, a jumpsuit, shorts, and jeans. I love that the heel isn't too high but it gives you just enough height. I sized up a half size for the best fit. You will love this comfortable heeled mule!